When I saw the headline “Foster Kid is Bucket Bomber” in The Sun, with similar ones proliferating around the web, my heart sank. A teenage terrorist who may have been a child refugee and taken into foster care is being talked to by the police. 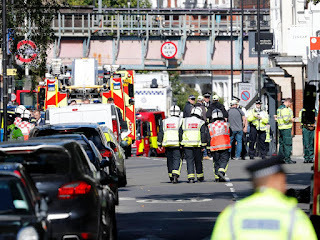 It is a godsend to every single foreigner-hating Islamaphobe who will seize on this – our – national tragedy of a narrowly averted mass murder on a packed tube train and say “I told you so”. It feeds the notion that there are terrorists in the midst of these refugees, including the younger ones, and offers the perfect excuse to ban them from entering this country, no matter how pitiful they appear. Such emotions and hatred are easy to provoke among some. Stop the refugees and other migrants coming in, so that argument runs, and you’ll have less terror. Some will go even further, claiming that if you “deport” the tens of thousands of suspects and individuals surveilled by the authorities you’ll be much closer to solving the problem. The heartbreaking thing is how many people will fall for this false logic and its seductive simplicity. It has to be answered, and not simply ignored or dismissed as casual racism. Well, if only terrorism was that simple to fight. Since 9/11 and before we have seen how tighter borders and migration controls have done little to prevent terrorists taking their evil work across continents, if they’re intent enough. Terrorists can get visas: they don’t have to hide in lorries. They either enter countries illegally or perfectly legally, in fact, if they are not known to the authorities. Alternatively, they are citizens born or naturalised in the very communities they attack, in which case immediate migration issues are not relevant. Sometimes their families are as well established as anyone’s, and the shock is as great to the parents as it is to the rest of the world. Terrorists come in many different forms: it is a great mistake to make assumptions about some profile or typical characteristic. It is certainly true that many currently do what they do in the name of Islam. As has been said many times, but never enough, that this does not make Islam a violent or terrorist creed. It has nothing to do with religion, and everything to do with power and politics, as terrorism always has been.